VERDER UK has announced the new Verderflex Dura 55 peristaltic dosing pump is now available, reported to deliver over 20% more flow - the highest continuous and intermittent flow of any pump in its size category. The company says the Dura 55 model extends the Dura range to allow flow rates from below 1L/hr to 15.3m3/hr up to 16 bar. 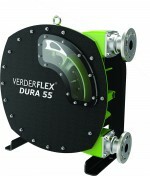 Verder says the Dura 55 is part of the next generation of peristaltic pumps from the Verderflex family. The range has been developed to meet the demands of engineers tasked with reducing the total cost of ownership over the life of a pump, said to increase the plant’s uptime and performance, even with arduous, heavy duty applications. As a peristaltic pump, the Dura 55 is said to perform exceptionally well with shear-sensitive fluids such as polymers or brewing yeast, highly viscous sludges or pastes and abrasive fluids and even those that are off-gassing. Where a fluid stream may run dry, require a suction lift, contain solids or need to self-prime the peristaltic principle is said to be perfectly suited, thanks to no wearing parts being in contact with the fluid. A simple hose design with a rotor providing a compression pushes the fluid through the pump, eliminating abrasive wear, permitting solids to pass and minimizing shearing effects on the fluid. Verder says these qualities make the Verderflex Dura 55 ideal for use in water treatment, chemical process, anaerobic digestion, brewing and filter press applications.